What better way to begin the new gig year than a familiar venue hosting three familiar artists in a unique format. 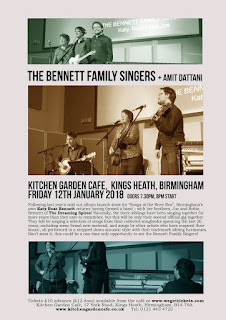 A near capacity audience was shoe horned into the angular sectors of the Kitchen Garden to see the second staging of The Bennett Family Singers show, and a first in the home city of its architect, Birmingham based singer-songwriter Katy Bennett. Together with her brothers, Robin and Joe of recent Dreaming Spires fame, a union of sibling harmonies was created, delivering a stripped back sound to a raft of songs, more often found in a haze of swirling electric guitars. However, acoustic was the de facto mode this evening, with the omnipresent guitar joined by fiddle, banjo and harmonica for frequent opportune moments. The intimacy of the stage presentation was conducive to a warm atmosphere being generated, with occasional insights to what a musical upbringing was like in the Bennett household, long before any family member saw it as a route to earning a living. Of course, such intimacy drifted into friendly rivalry, which added to the reality of three family members sharing the spotlight. Blossoming from these moments was an obvious inbuilt sibling harmony; utilised to its utmost during songs shared in the company of friends and fans alike. Katy’s approach to her recorded music is finely balanced with other commitments, but the 2016 album SONGS OF THE RIVER REA was a highly commendable effort. This evening’s reflection of that release was best focussed on the tracks: ‘Rusted Ring’, ‘Soul in the Soil’ and ‘Jack and Ivy’. The former acted as the solitary up- tempo moment of the night, while the latter was quite rightly called out by Joe as an excellent song. Katy also delved a little into her musical influences, and a version of K.d. Lang’s ‘Nowhere to Stand’ took a few folks back to 1989. The Dreaming Spires may well be on an extended hiatus (give or take the odd appearance) that will leave fans guessing as to its length, but a small selection of their songs are still bursting with life when given a live airing. ‘We Used to Have Parties’, ‘Laughing & Dancing’ and ‘Singing Sin City’ were all successfully moulded into stripped back acoustic pieces for this show. While the latter used to have a snippet of the Flying Burrito Brothers’ ‘Sin City’ blended into the live version, this evening we were afforded this classic Gram Parsons tune in its entirety, led off by Joe before the others chipped in. Unequivocally, the highlight of the show was a moving rehash of the Spires masterpiece ‘Dusty in Memphis’. As good as the standard version of this song is, the trimmed down playing magnified the composition to another level. A re-issuing of the song in this format could be envisioned as a success, although sometimes it is just best to celebrate the instantaneous nature of enjoying a live song in a fresh format. Any Dreaming Spires hiatus does not mean periods of inactivity for the brothers. Robin reminded everybody of his recent involvement with Sarah Cracknell’s influential 90s band Saint Etienne, with the playing of a song written for her called ‘Take the Silver’. Literally, 48 hours prior to this gig, information surfaced on Robin’s new project, simply titled Bennett Wilson Poole. This sees him reunited with his Champs compatriot Danny Wilson for a release that will likely create a few waves in the forthcoming months, and keep its architects busy. Meanwhile, Joe continues to be a key member of the prolific band Co-Pilgrim and more music from them is likely to be on the horizon soon. Personal projects apart, this one-off show (now given a second showing after a Bewdley debut last year) is all about going back to your roots and not forgetting the musical grounding required to forge a fruitful career in this sphere. A successful evening was eventually crowned with an encore version of ‘The Weight’, a song with a timeless appeal to bring together collaborating artists for one final hurrah. The night had earlier been opened with a set by Birmingham singer-songwriter-guitarist Amit Dattani, who is preparing for the release of his debut solo album in March. An attempt to hone in on a finger picking - old time roots sound is shapely up nicely, with balance provided from a more contemporary lyrical input. Without doubt, the release will retain Amit's presence on the local Birmingham gig scene and it will be interesting to see how these songs roll out in the dual role of recorded and live numbers. Family collaborations have been around since music’s year dot and are likely to be so until time is called on all of us. A little bit of room was created for the Bennetts to share their innate talent with the enlightened few, and the reception surely made it a worthwhile venture. Whether Bewdley and Birmingham are the only stops on the trail of The Bennett Family Singers is probably solely in the hands of the protagonists, although the pull of popularity may play its part too.